I know about enhancers and the mechanism that lead them to increase the gene expression of their targets but I was wondering if similarly DNA repressors exist. I know about protein repressors but I am looking for some kind of anti(or reversed)-enhancer equivalent in the genome which would act like an enhancer but reduce gene expression. I am aware of repressed/poised enhancers which would kind of be that process, even if not really a pure repression of the target gene but rather a "non-overexpression". I also know about insulators but again this would be a different mechanism. Some intergenic region binding protein repressors which by a folding mechanism similar to enhancers would repress a gene perhaps? Yes, these sequences exist and they are called "silencers" (surprising, right?). There are different mechanisms by which this silencing of genes can happen. Additionally there are non-classical negative regulatory element (NRE), which are usually elements upstream of the promoter which inhibit the binding regulatory proteins. NRE can also be enhancers depending on the proteins bound on them. Some NRE can induce a bend of the DNA, inhibiting the access to enhancer or promoter elements. 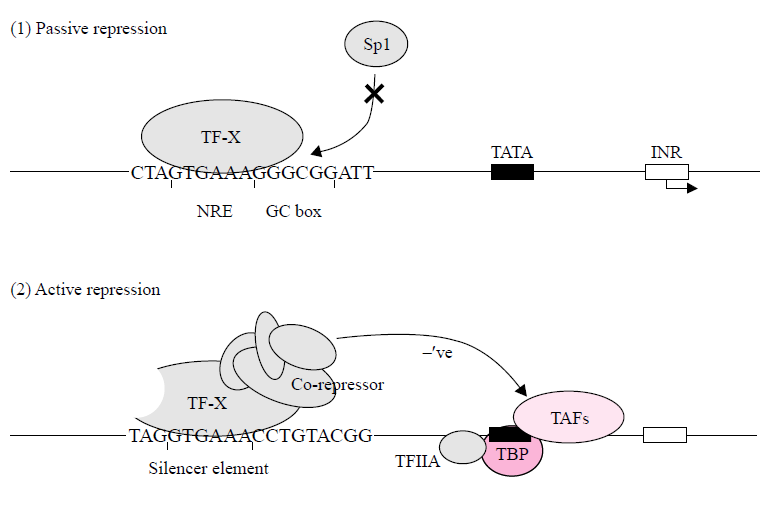 Transcriptional control and the role of silencers in transcriptional regulation in eukaryotes. Not the answer you're looking for? Browse other questions tagged genetics dna molecular-genetics gene-expression gene-regulation or ask your own question.